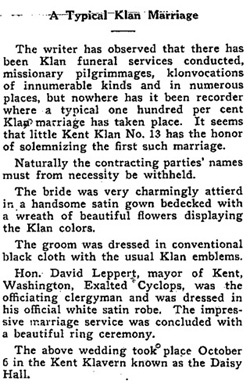 “KKK Wedding” in Sedro Wooley, Washington, June 16, 1926. Courtesy of the Skagit River Journal. These were just some of the innovations that the Ku Klux Klan sought to introduce to its members in the Pacific Northwest during the 1920s. 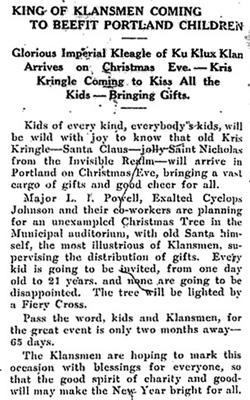 And while such rituals were rare even among most Klansmen, and never gained popularity (most notably in a failed “Klan Frolic” in Portland staged by Luther I. Powell), they show how the Klan sought to insinuate itself into people’s everyday lives. On the one hand, the Klan attempted to transform some of the most sacred activities in American life at the time. It treated activities which most people viewed in religious terms as political acts that needed to include self-conscious displays of patriotism and white supremacy. 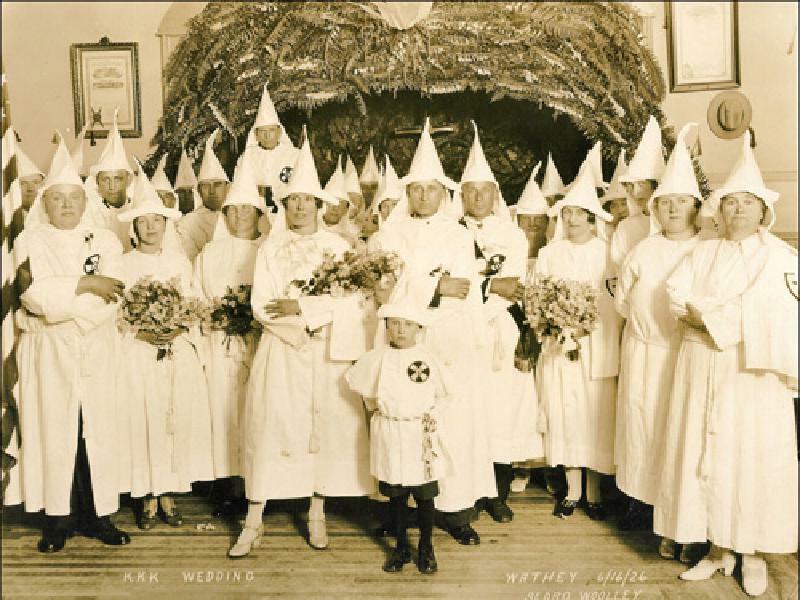 On the other hand, unusual rituals like the Klan wedding and Klan Christmas showed the shameless depths to which Ku Klux Klan marketing could go. 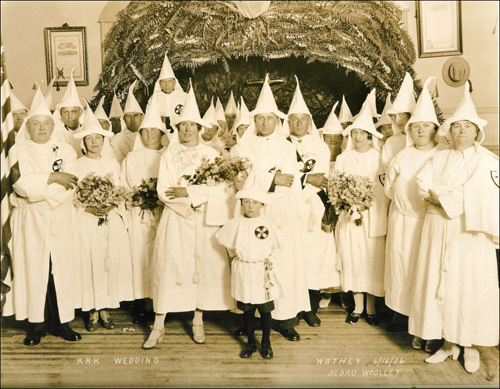 The Klan recruited members by marketing itself as a means to celebrate and support that which most white Americans did already: go to church, get involved in civic groups and fraternal orders, participate in family life, and vote. The Klan would capitalize on people’s insecurity that these activities were under threat from within and without, and offer itself (for a fee) as a kind of protector of tradition. The ultimate goal of such marketing was to transform people’s everyday habits so they came to think that being American was synonymous with being a Klan member. Conversely, in its attempts to politicize people’s private lives, the Klan sought to define as un-American those who had different cultures, different religions, different skin color, and different sexualities.